Canny, these tour operators! To keep the headline cost down and lure the would-be travellers, so many crucial visits are termed ‘an optional extra’. 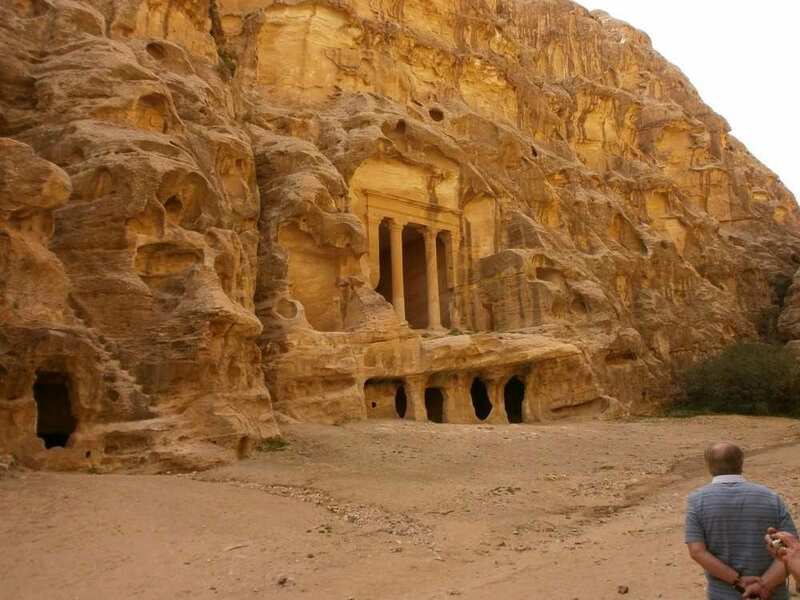 How could one visit Jordan without seeing Little Petra, the ancient settlement nearby and not tread the earth where caravans of 500 camels at a time were fed, watered and rested, and the merchants wrangled with the masters of the road, the Nabateans? We had to pay extra, and everyone in our group did. Ibrahim took us the farthest back in time to probably, with one near Jericho not far across the Jordan, the earliest known human settlement. This thrilled me. 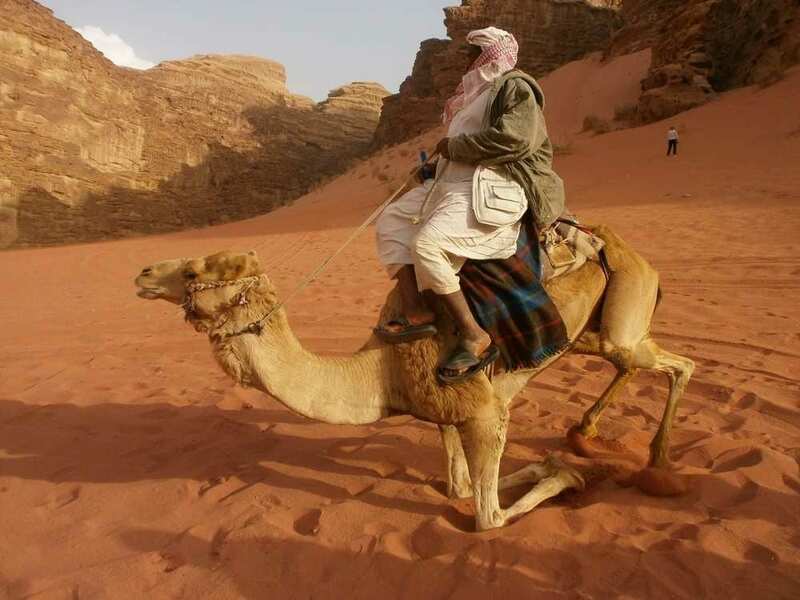 Side by side with still – almost – nomadic Bedouins living in tents, however efficient even in the bleak winters here and the desert chill at night, was the first human settlement. Or one of them. Now it is accepted that early agriculture co-existed with the hunter gatherers, even in the same community, and so it was here in this wide valley of rocks and pebbles and the memory of seasonal flood water. Ibrahim pointed out the early round dry stone buildings – no lack of stones here! Above them were Bronze Age buildings. Trade better, more families and bigger, square-cornered buildings were built, as ever, saving by reusing foundations and building materials. Archaeological sites aren’t the easiest to unravel. This was to become a Unesco one, but the money and will ran out or, more likely, with Petra and Jerash, and a population of only 7 million, Jordan was deemed to have more than its fair share of Unesco World sites. Such are the reasonings of bureaucratic fairness, but I digress. So the explanatory boards helped a little, and our guide more, but a visitors’ centre would have made a difference. Or perhaps not. A solitary woman stood carding lambs’ wool, showing us how it was done. This is far better than begging, and we gave her the pittance Ibrahim recommended. Temple tombs were scattered along the track along the edge of the wadi below the rocks. 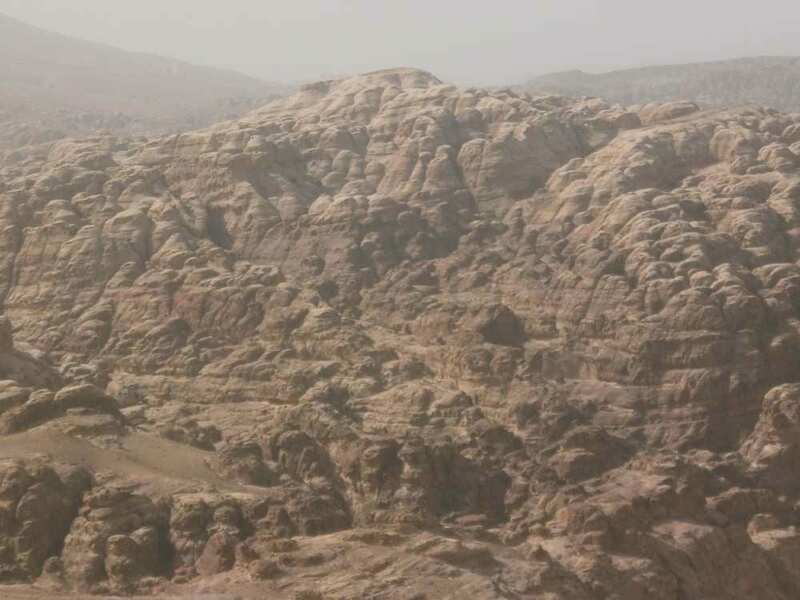 I imagined it would be like the ones used by Moses: sand on rock along wadis in the dry season – perhaps the crossing of the Red Sea was when the torrent dried up more rapidly than was usual? With the vagaries now ascribed to climate change, such events shift from miraculous to possible, but God can help it along. Like Petra proper, Little Petra is entered along a narrow gorge, but much shorter, from the open area where the caravans gathered. You can imagine the 500 camels kneeling down then lowering their back sides to chomp away, looking meanly around, or to poke their hindquarters in the air then, noses lifted and forelegs levering this efficiently awkward and unlovable creature onto its four legs. Imagine the stench of manure, used as fuel and fertiliser, or perhaps the camel-boys cleared it off with what I imagine to be Nabatean efficiency. In the main square of Little Petra, business was conducted in the simpler secular rooms hollowed out of the sandstone, now blackened by soot from the fires of people who have lived there in recent times. Ibrahim explained that after the deals were worked out, they were celebrated with banquets. There were water reservoirs and steps cut in the rocks to clear and control the water channels. 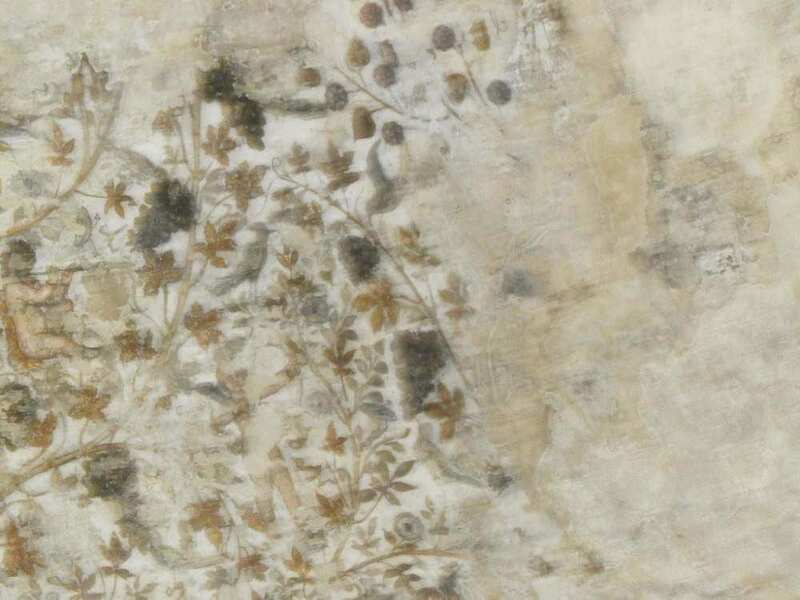 We climbed worn steps to an upper chamber with faded frescoes of a leaf pattern and figures clinging to the tendrils. It, too, had been covered in soot and some of the colour had been removed in the cleaning; nonetheless, it told of light-hearted celebrations in a fictive arbour inspired by the sort of painting Greek artists left in the contemporary cities of Herculaneum and Pompeii, destroyed in 79 AD, that is 27 years before the Romans conquered the Petra valley of the ancestors and the Little Petra caravan centre. 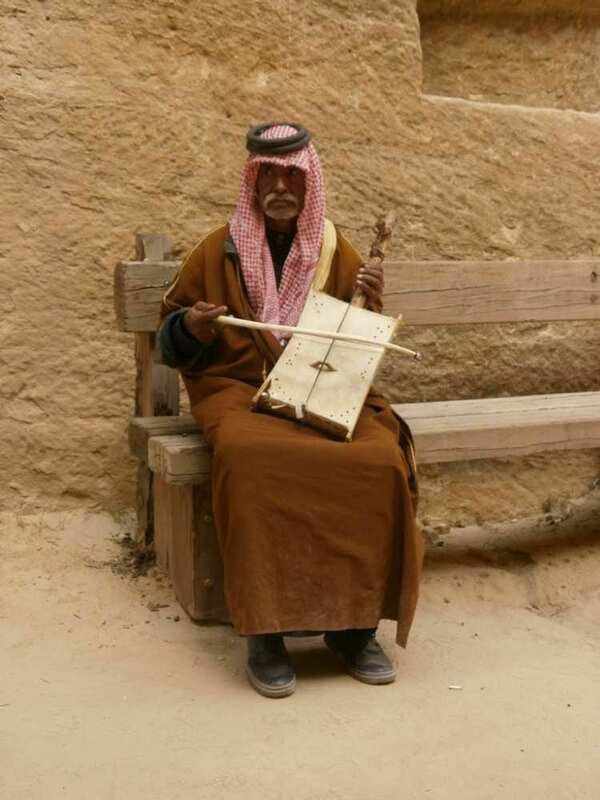 Below us an old man played the single-stringed oud for us, a plaintive sound. We rewarded thanked him in the same way as for the old woman. Thus the money merry-go-round from the ‘widow’s mite’ to the mega bucks! You had a good guide, or maybe I have forgotten some of the information. I remember only that we were told Little Petra was ten thousand years old or so, and I wondered whether the low stone walls really were the walls of houses that old, or just fantasy. Whatever the case it was moving to wonder about the distant past.